It's not every day that you can reboot an entire institution, but the Noel-Baker School in Derby, UK was able to do just that: its beautiful £40 million new campus gave it an opportunity to rethink how schools should look and work - and to slash its IT management bills by a whopping 50 percent. As the school's network manager Lee Jepson explains, IT "plays such a fundamental role in education nowadays" - particularly so at the Noel-Baker School, whose in-house IT team also helps other schools and local businesses. "We really wanted this to be a shop window for what IT can do in schools and to provide greater productivity for businesses," Jepson says. The school already had an excellent relationship with its IT supplier Dell, with Dell PowerEdge servers networked to a combination of OptiPlex desktops and Latitude Laptops. Jepson was impressed by their reliability and flexibility, but he also wanted a more efficient way to manage them - so he turned to Dell's KACE appliances, which delivered more functionality and significant time savings in patching and deployment. Jepson also specified ultra-fast 10-gigabit Dell Networking 8024 switches, two Dell EqualLogic PS6510X storage arrays and PowerEdge servers running Windows Server 2012 with Hyper-V, a virtualised environment that delivers all of the school's applications. With the back-end systems in place, Jepson turned his attention to the most important part of the school's IT: the people who would use it. A brand new campus meant that Jepson could work from a clean slate, and that enabled him to come up with something very different and very effective. 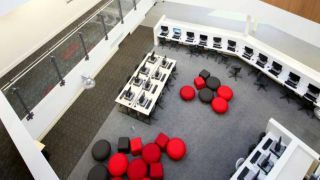 Jepson created "learning plazas" around the school featuring OptiPlex desktops for students to use during breaks, replaced the library with a desktop and laptop-stuffed resource centre, and took care of classrooms using a mix of desktops and Latitude laptops on wheeled trolleys. The choice of Windows Server software also enables the school to deliver remote access both for students, who can complete coursework from home, and for teachers, who can access their essential applications and files from anywhere. It's an ambitious project. Has it worked? Lee Jepson is delighted. "It has freed us to add more value to the school," he says. Teachers no longer need to spend valuable time setting up and tweaking IT equipment before lessons can commence, and new software can be introduced into the teaching environment more quickly than ever before. Students are more engaged with their work thanks to faster access and up-to-date applications. There's a financial component too. The combination of simplified storage and server management has reduced management time by a whopping 50%, speeding up support responses and freeing up time for the IT team's outsourcing operations. And thanks to the KACE appliances, much of the drudgery of IT admin is now entirely automated, with the appliances taking care of software distribution, patching, operating system installation and system recovery without disrupting anybody's day. If this were an exam, the Noel-Baker School would get a well-deserved "A".